The most important of witnesses of this glorious past is undoubtedly Su Nuraxi archaeological zone. Discovered and brought to light in the Fifties, during excavations conducted by the great archaeologist Giovanni Lilliu, the area consists of an impressive complex nuraghe, built in different phases as from the 15th century BC and an extended village of huts developed all around it during the following centuries. The complex occupies an area of over 1,000 square meters, and was used and inhabited long after the Nuragic era too. A wonderful place that now since 1997 has been enrolled in Unesco World Heritage Lists because of its uniqueness in the world. 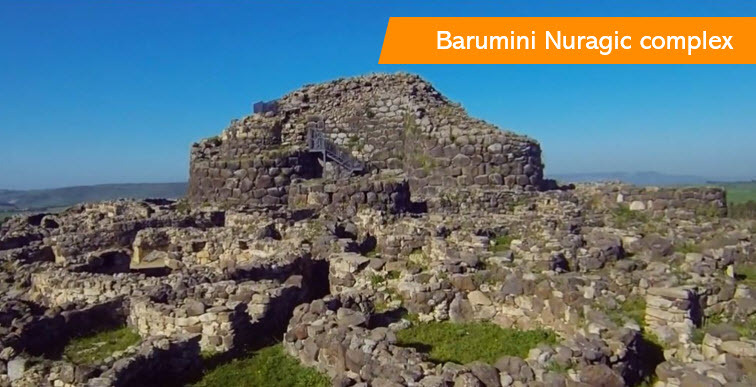 A great heritage, that one of Barumini, which has been enriched recently of another wonder: Su Nuraxi ‘e Cresia. Another complex nuraghe brought to light in the Nineties during the restoration works of Casa Zapata, the old noble residence of Zapata family, coming from Aragon, built on the complex nuraghe as from the end of 1500. So it’s remarkable to enter into a 16th century palace and then unexpectedly find yourself facing a very impressive nuraghe that you can visit by elevated walkways and glass floors making your viewpoint unique and inimitable. Today the Spanish residence, consisting not only of the palace but also of a beautiful garden overlooking the parish Church, a large court and agricultural set of buildings built as from the beginning of 1900, is the seat of the so-called Casa Zapata Museum organized into three sections: archaeological, historical and ethnographic. Attention: access to some of the rooms inside the main building is quite difficult (high steps, narrow tunnels...), but this is only a small part of the whole visit experience.